I know what you’re thinking. They can’t seriously be planning to feature Allie Sommerville in a month where they’re celebrating the joys of the open road? For those who haven’t heard the news yet, Sommerville is the author of Uneasy Rider: Confessions of a Reluctant Traveller, and we’re doing an interview with her today, as well as an e-book giveaway (for DISPLACED DISPATCH subscribers only — sign up NOW!). But before we proceed, allow me to say a few words in Sommerville’s — and our — defense. I would concur. In my own interactions with Sommerville, I’ve come to think of her as a gentler, more light-hearted version of Robert Pirsig, who penned the brilliant, if opaque, Zen and the Art of Motorcycle Maintenance, on which we’ve based many of our posts this month. The two have much more in common than it may at first seem. Like Pirsig, Sommerville has faced the reality of sustained travel on the open road and the many challenges it entails — particularly if your vehicle of choice is a motorcycle or campervan. Also like him, she has concluded that for a road trip to be a success, you must have a yin and a yang. The main difference is that for Sommerville, these concepts are physical, not metaphysical — as in two people, herself and her Other Half, Harry. She is the yin — the dancer, the poet, the writer — to poor Harry’s yang. He is the driver of the couple’s broken down but beloved RV, in charge of all repairs. And when things go awry, as they very often do, Sommerville injects a philosophical sense of humor for some perspective on the situation — a technique on a par with Pirsig’s philosophical musings. Take, for instance, the very first road trip the couple made in this rickety vehicle, to Spain — all because Sommerville had developed an obsession with British poet Laurie Lee‘s memoir about tramping through Spain. By now we were becoming aware that we’d attracted the interest of several ancient and well-oiled patrons of a bar just up ahead, and our little drama turned into a full-scale pantomime as they began gesticulating and beckoning us on. “Sí! Sí!…Se puede!” they exclaimed excitedly and at the same time doing what could only be described as some sort of grotesque ritual dance. This was a good time to remember the meaning of those words in my favourite scene from the language video. “Se puede! They seem to think we can do it!” I translated helpfully. So, without further ado, I give you the light-hearted Robert Pirsig: Allie Sommerville. Tell me a little more about your background. I was born in Croydon, which was in the county of Surrey at the time — now though, notoriously part of Greater London — and my husband is from London. After setting up home in Croydon for a few years, we moved to the Isle of Wight in 1976 to build our own house and give our two young children a better area to grow up in. Uneasy Rider, which was published in 2009, was my first book. I’ve just published my second, a memoir about my childhood, on Kindle. It’s called To set my feet a-dancing and takes a light-hearted look at a time when children were allowed play in the park until dark, clothes were home made and owning a car meant you were rich. I draw a lot upon my time as a young amateur dancer, telling about my appearances with my older sister in shows arranged by our rather eccentric dancing teacher. I also look at schooldays, Christmases past and seaside holidays in an age of innocence. I began this project after researching my family history for many years. It occurred to me that our children have no idea about how my generation lived as children in late 1950s England. Life has changed beyond anything we could imagine. I conclude the book with the life stories of my grandparents and their predecessors — things I have gleaned from censuses, birth and marriage certificates, old photographs and conversations with my late mother. These are the lives of ordinary families: people whose lives are not in the history books. I’m also in the process of writing about a trip my husband and I made around mainland Great Britain in the same old camper van, from the South (i.e., Isle of Wight) to the North (i.e., Scotland). The provisional title is: Miss Potter and the Mathematicians Rabbit — Allie Goes Oop North. The main title is taken from an experience we had in the Lake District. Moving on to Uneasy Rider: How many road trips have you and your husband made together over the years? We made six road trips in the converted Leyland Daf campervan of the book, from 1999 to 2004, though our very first trip in a motor caravan was in 1991, with our two teenagers on board. Do you ever travel by other means? Of course! We’ve traveled many times by car in France and Switzerland, staying in gîtes, chalets and apartments. My favorite “trip” of all though was on the Cunarder, Queen Mary 2, to New York. Much nicer than “roughing it” in a camper van! I absolutely loved New York and the glamour of the six-day Atlantic crossing, despite sailing through a force 11 gale. 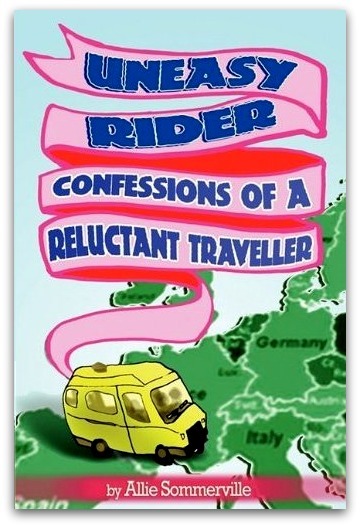 So what made you decide to write a book about your campervan excursions? During our trips, we had so many events that each time I said, “There’s a book in this!” Before we took off on our first trip (to Spain), I hadn’t found any similar book on the subject of campervanning or caravanning, apart from site-finder guides; it seemed there was a gap in the market. Whom did you see as the primary audience? Bill Bryson is the master of modern travel writing as far as I’m concerned, and it’s his light-hearted touch that I hope in some way to emulate. A tough act to follow! Many people take road trips when they are young, to find out more about life and themselves. Does the purpose change once you become middle aged? Middle aged? I still feel about 17! As you’ve already mentioned, the purpose of our first trip (to Spain) was to follow in the footsteps of my literary hero, Laurie Lee. In As I Walked Out One Midsummer Morning, he tells of his walk across Spain on the cusp of the Civil War in the early 1930s. This book, for some reason, holds a big fascination for me. That trip was meant to be a one-off. But afterwards we weren’t able to sell the van, so instead of letting it sit in the drive, I seized the opportunity to see as much of the art and architecture of Italy and France as I could. I suppose you could say my purpose was educational! Which was your favorite place of all those you visited? Florence has it all. I could never tire of it. We visited this amazing city three times. I was studying Art History at the time, specialist subject “The Early Renaissance.” The Italian people are fantastic, too! Spain, especially the Costas (various coastlines), which were full of half-finished blocks of flats. Whether we were unlucky I don’t know, but it was not a friendly country — apart from a few honorable exceptions which I mention in the book: the helpful policeman in Seville who strode into and held up four lanes of speeding traffic for us, the patient shop assistant in the flamenco boutique. I have the feeling that relatively recent history may have altered the Spanish character: George Orwell in Homage to Catalonia found the Spanish people cheerful and friendly. Robert Pirsig says “It’s a little better to travel than to arrive.” I’m guessing you might not agree with him? Err…not really. Like Dorothy, my mantra is: there’s no place like home! Having the campervan, however, was almost like taking your home round with you. My best moments during these trips were when we found pleasant campsites to put down temporary roots. Pirsig claimed there are two types of people: “classical” — practical, DIY fixers, boy-scout prepared types; and “romantic” — those who thrive on surface appearances, don’t want to get involved with the nitty-gritty, and thrive on gestalts. As you noted in your introduction, I’m definitely “romantic,” and my husband is certainly “classical” — which probably explains why we work as a couple. He drives and sorts out problems, I look forward to seeing the Da Vincis. Each chapter of your book is a stand-alone story, describing a particular incident. Do you have a favorite? “The Parable of the Parador” is my stand-out favorite. As I said, it is typical that I get these romantic ideas — and my other half goes along with them, most of the time. That particular chapter though, sees a bit of role reversal, when we get “stuck” on the road into Arcos de la Frontera, to reach the parador (state-run hotel). For once he thinks it’s all hopeless, and I have to be the optimist. When he feels like this about a situation, I know we are REALLY in trouble. Pirsig advocates traveling on a motorcycle because it puts you there, in the moment, without the barrier of a windscreen. What do you think of his philosophy? To travel on a motorbike would be my nightmare! I just would feel too exposed. I like to be safe — hence the theme of Uneasy Rider. Many of the Displaced Nation’s readers are expats. Can you imagine living anywhere besides the Isle of Wight? We’ve often thought we should have relocated to France some years ago. I’d love to live in a place where you can walk to a baker’s every day for fresh baguettes and croissants. Now, the only place I’d move to is Central London: the London National Gallery and Covent Garden Royal Opera House are big draws. How well do you fit back into the Isle of Wight after your journeys? Do you suffer from any counter culture shock? The flippant answer is that being a “townie,” I suffer counter culture shock on the Island every day anyway… even after all this time. However, the main feeling after being in the ‘van for four weeks, though, was that our house did seem HUGE for the first few days . So what’s next for your travels? Next year I am fulfilling my long-time ambition of visiting St. Petersburg — on a cruise ship rather than by road. Russia and especially its Tsarist past, fascinates me. Hopefully there will be a book in this, though for all the right reasons! Readers, do you have any questions for the Amazing Allie? Ask away, before she takes off again! 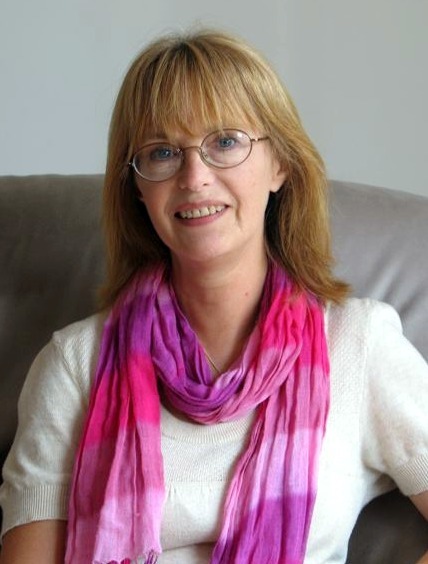 Images: Allie Sommerville’s author photo and book cover. STAY TUNED for tomorrow’s installment from our displaced fictional heroine, Libby, as she prepares to welcome the pitter-patter of little feet. Clawed, furry feet, that is: Fergus is now a canine expat! What, not keeping up with Libby? Read the first three episodes of her expat adventures.